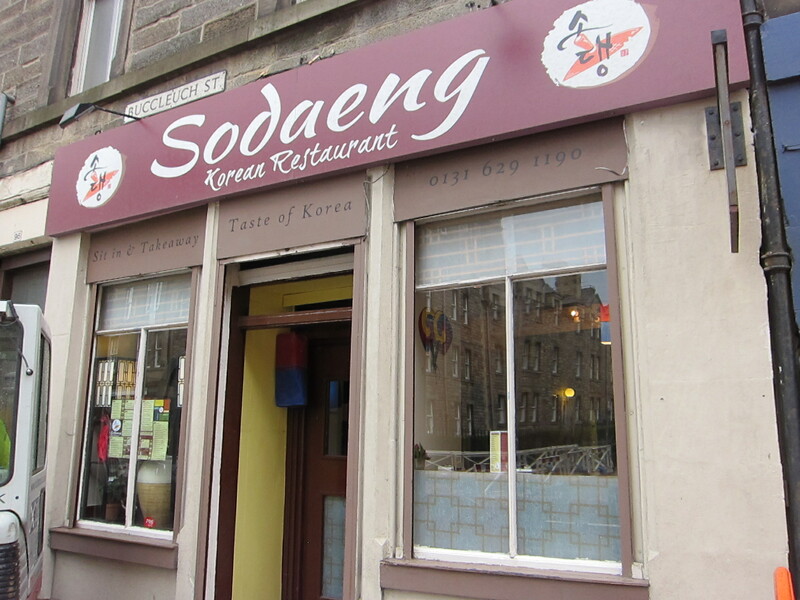 I’d seen Sodaeng before, of course — it’s just across the street from Cafe Andamiro and not too far from Kim’s Mini Meals, which, I suppose, makes this few block stretch something akin to Edinburgh’s Koreatown. Since I had a free lunch slot, I decided to mosey on over. 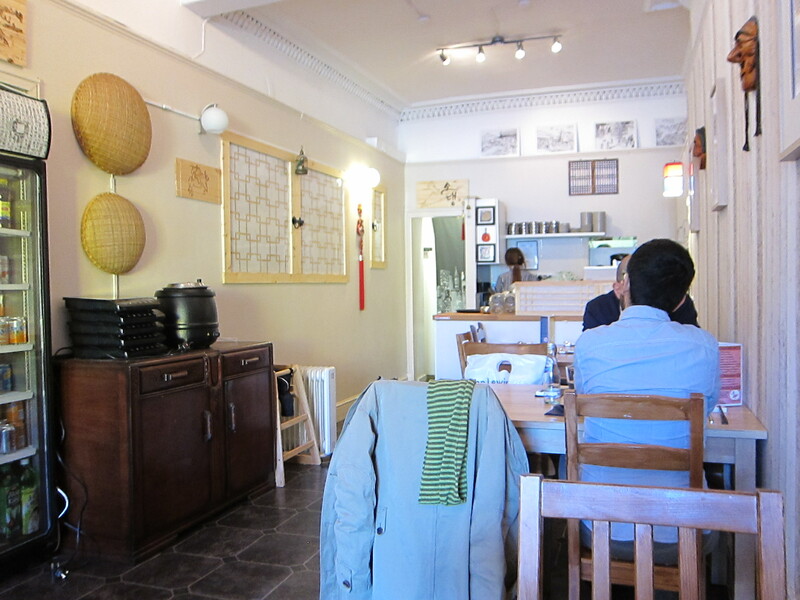 The restaurant is tiny — just a handful of tables and a kitchen in the back. 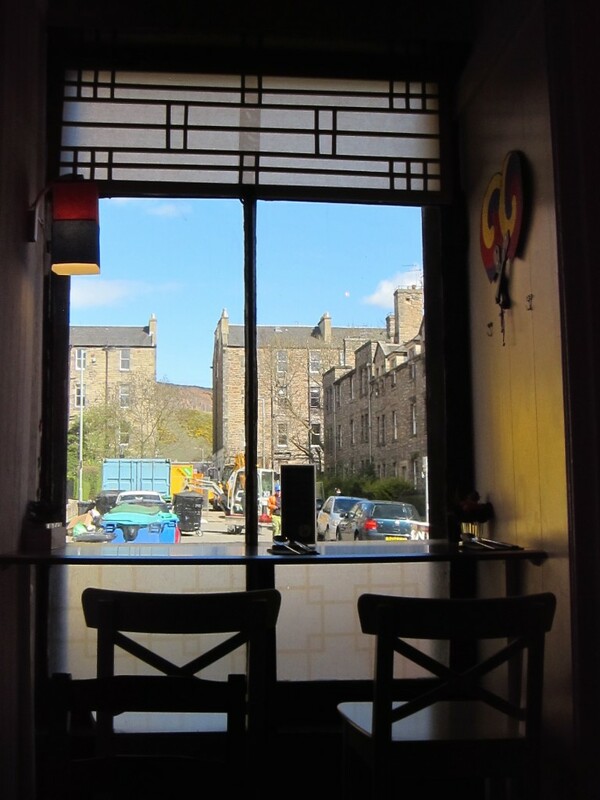 I liked these little bar counter seats with a view out the window. Sodaeng apparently means the lid of the “gamasot,” which is a large iron pot used in Korea for cooking, the menu explained. 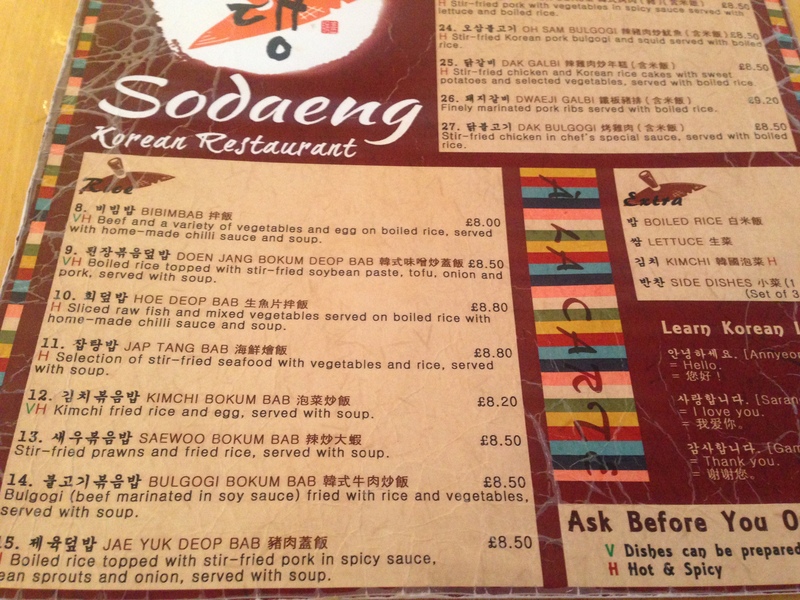 Speaking of the menu, Sodaeng’s made me instantly suspicious. Look at how many items are listed here. 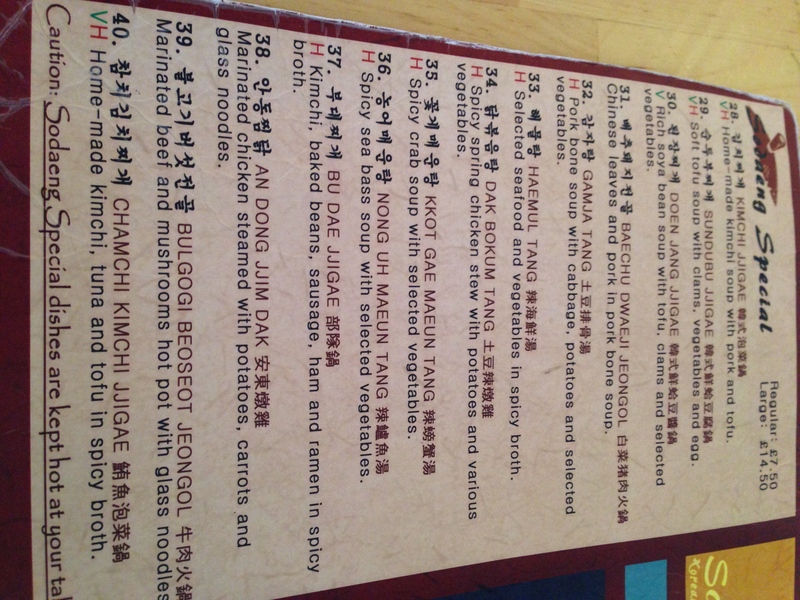 And this is only one small section of this two-sided menu. Here’s another bit — and trust me, there’s lots more. Sodaeng’s here was about the size of menus you’ll find at New York City‘s Koreatown restaurants, some of which have massive kitchens as well as dining rooms that span several floors. Regardless, I was seated — and hungry. So I decided to order. 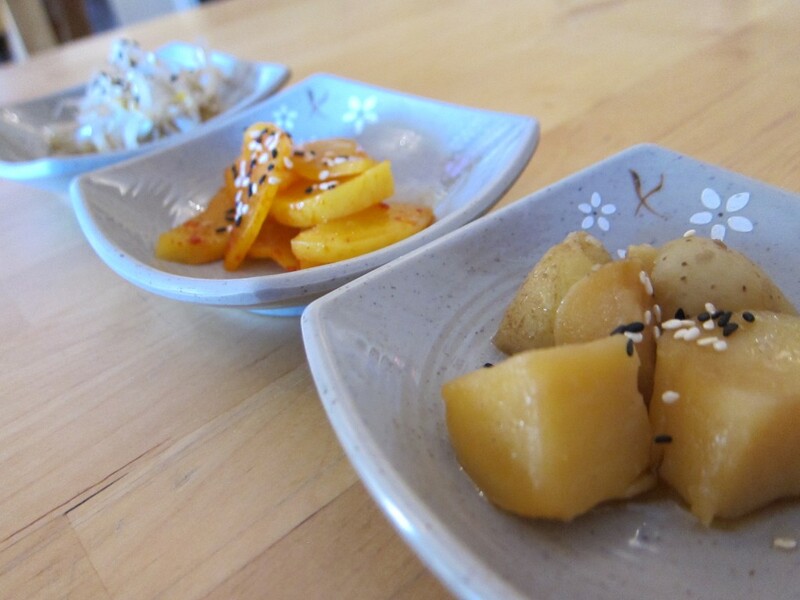 First, the banchan (small side dishes) arrived: spicy pickled daikon, potato and bean sprouts, each sprinkled with white and black sesame seeds. This was a slightly boring and tasteless selection but, perfectly OK.
At three for £4, the fried mandoo struck me as rather pricey but I decided to see if they might be worth it. 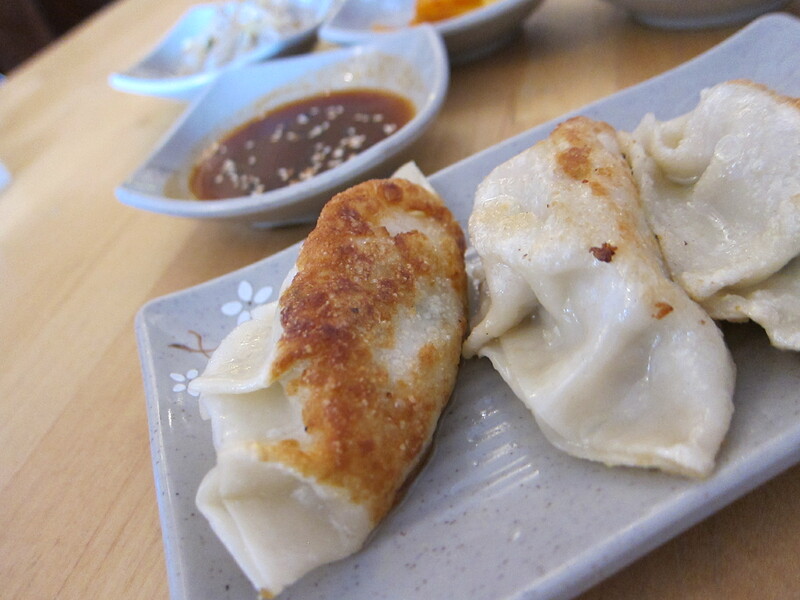 By any standards, though, these would not be good dumplings — the filling, in fact, had the distinctly stale taste of meat that had fairly recently been defrosted. I could bring myself to eat only one of the three. For my entree, I’d considered ordering what the student suggested but thought I should judge this restaurant on a more standard Korean dish perhaps, to be fair. 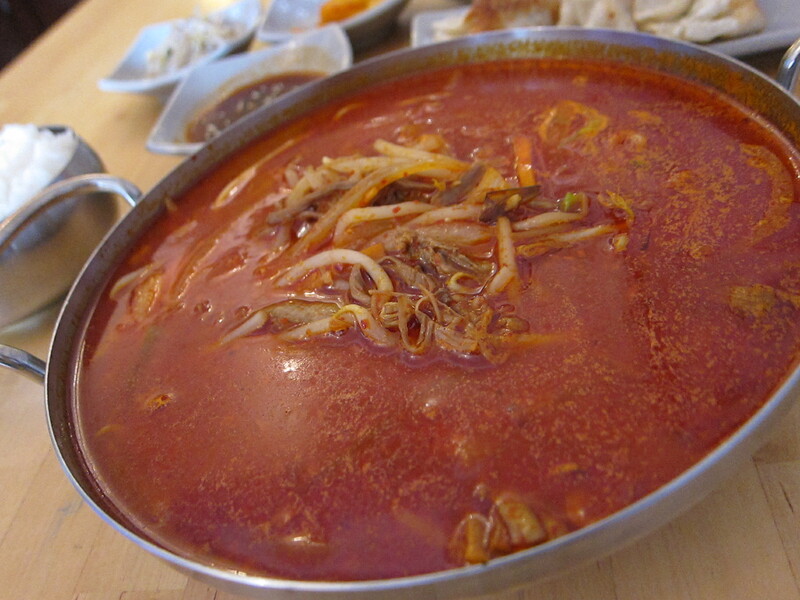 So I ordered the yukgaejang (£8.80; pictured up top), a traditional spicy beef and vegetable soup. 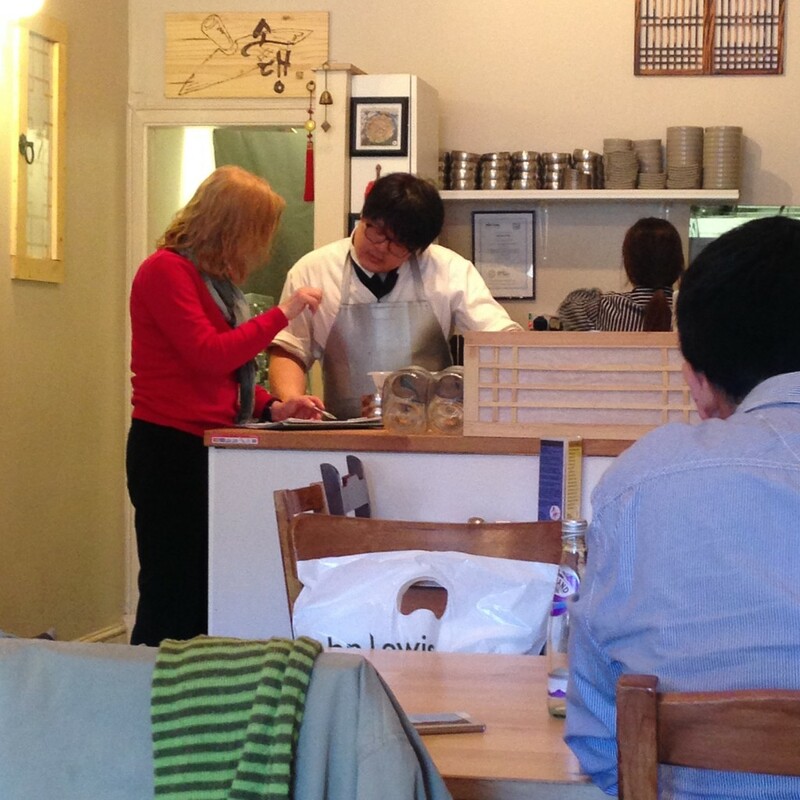 Now, if you’ve been following my Edinburgh food adventures on this blog — or over at my Tiger Facebook page — you’ll know how excited I was when Cafe Andamiro’s yukgaejang landed on my table. Just look at this video and you can see the life and the spices in their version of this dish — it simply could not stop bubbling for many minutes after the waitress had set it down. OK, now compare that video with the picture above. That film of grease you see on the soup? It coated my lips from my first sip. The beef was perfectly fine but the flavor of the overall dish was off — it was just a touch too sweet and lacking in some of the earthy flavors that make yukgaejang a terrific, heady melange. As I made my way through this greasy, lifeless soup, hoping that it might turn for the better at some point, I noticed a slight hubbub. It turned out health inspectors had been doing a checkup the whole time I’d been there. Perhaps I’d been wrong to not try the dish a regular had recommended me. But at the end of the day, I’m inclined to think that if you can’t nail the basics of the cuisine you’re supposedly serving up, then there’s just little point in sampling the rest.